A recently published analysis compiled by Lauri Myllyvirta and Greenpeace International showed the unthinkable -- Chinese coal consumption fell for the first time this century in the first half of this year. Even more striking is the fact that China's gross domestic product (GDP) growth and coal consumption have decoupled, suggesting a structural shift in the Chinese economy. Taken in sum, with potential policy shifts associated with the upcoming five year plan and China's war on coal, these look like the first indications of an approaching peak in coal consumption. 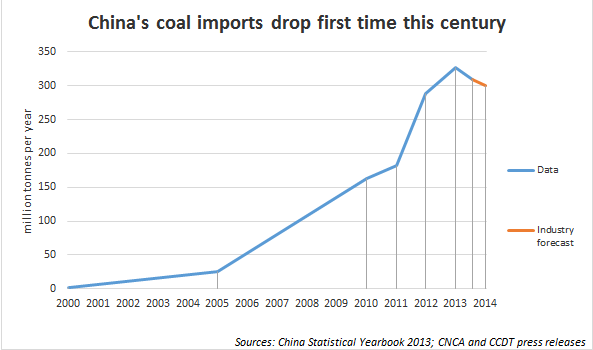 Now, new statistics [source in Chinese] from August show another first: Chinese coal imports in the first eight months of 2014 dropped by 5.3 percent. This is the first time the import rate has dropped since the country became a net importer in 2009. More importantly, the industry forecast indicates an even steeper 8 percent drop by year's end. So much for the Asian supercycle, Peabody Energy. But there is something far more important happening here than simply putting an end to the last remaining lifeline of the moribund U.S. coal industry. 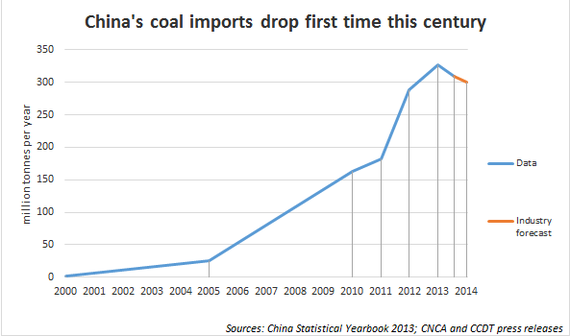 China has single handedly driven the growth in coal consumption we've seen over the past decade. But, it is increasingly clear that the time of unending coal growth is nearing an end. Peak coal consumption is one thing, but avoiding the entrenched emissions of the enormous coal fleet China has already built is another. The crucial decisions to secure a peak in coal consumption -- and reduce that consumption in absolute terms -- will be made in China's new five-year plan, currently under preparation and covering the years 2015-2020. That means all eyes are on China's next moves in its war on air pollution. For citizens struggling under the weight of 'airpocalypse,' those moves couldn't come a moment too soon.